I can pocket and profile a shape. 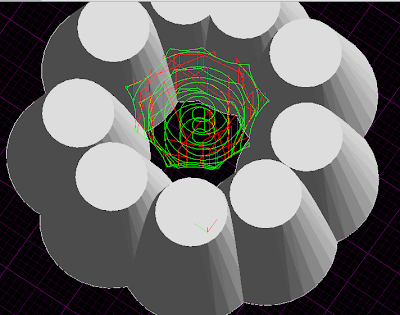 Profiling operation will start at the start of the shape. 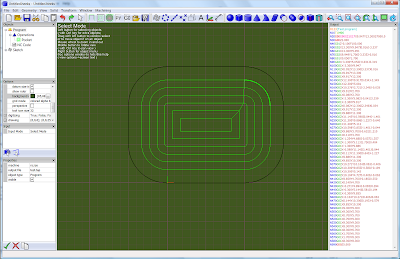 So, currently I need to draw the shape starting from the right place. It would be better if the profiling operation had start and end points, optionally. My 6-year-old daughter asked me to carve a kitten out of wood. I had some bits of an old apple tree from the top of the garden. 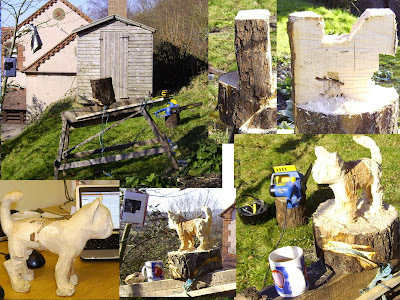 The chainsawing only took about 1.5 hours, the finishing could take as long as I'm prepared to give it. To do islands, I have to make sure I draw the islands going the other way to the outside. These examples all have outside clockwise, inside anti-clockwise. There seems to be problems sometimes with using a rounding factor of 1.5 ( sharp corners for right angles ). 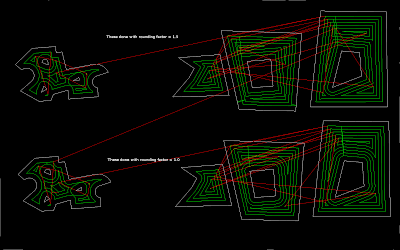 Ignore all the red lines, I still have work to do, linking the paths together. 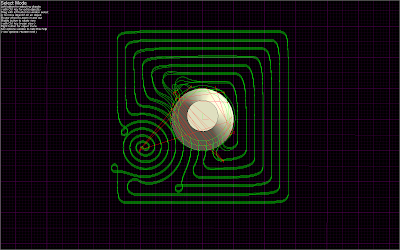 I have made the "area" code convert the little lines back to arcs, so the NC code now has arc moves in it. This machine was originally built by my Dad, when he was younger than I am now. We tried to make it CNC. I got Dad to make the gearboxes for the stepper motors. Later, I tried servo motors ( slot-car motors ). I was always being too cheap, using motors that were too small. I never had it reliably working. It is still useful as a manual miller, like it always was. The weights are to remove backlash. HeeksCAD works well on it. The Open CASCADE package from http://www.opennovation.org/ubuntu/ wouldn't download. 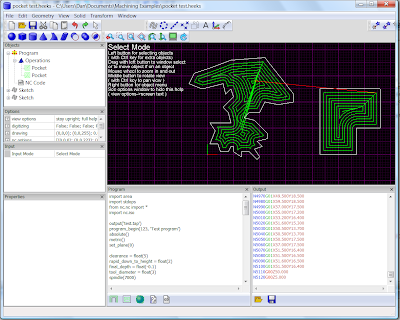 So, I had to download the Open CASCADE source code and build it. It took over 6 hours to build. #cam guys are having trouble with plugins again, for HeeksCNC. 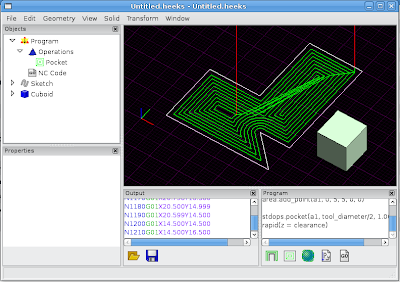 The only plugin needed for HeeksCAD is the HeeksCNC dll ( or .so file ). 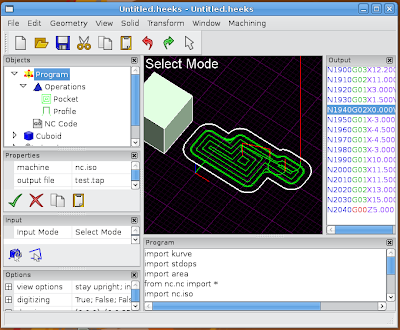 HeeksCNC adds the "Program", "Operations", "Profile", "Pocket", "ZigZag", "NC Code" object types to HeeksCAD. It uses these to create a script and then copies that script to a Python file "post.py". 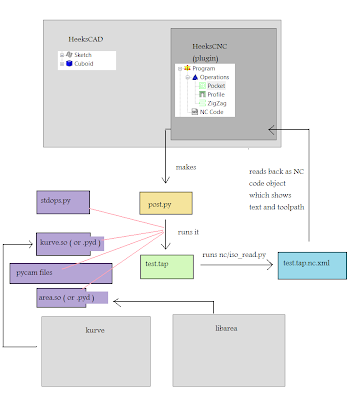 This file is a stand-alone Python file, that can be run outside HeeksCNC ( for testing, for example ), but it will need various Python modules to do this. kurve.so, actp.so and area.so, are Python modules. They should not be added as plugins to HeeksCAD, they are not HeeksCAD plugins. They just need to be built and put in the right place. At the moment, post.py expects kurve.so and area.so to be copied to HeeksCAD\HeeksCNC. When post.py is run, it should create the nc file ( test.tap for example ). When post.py has been run from the "G0" button in HeeksCNC's program window, it then calls nc/iso_read.py to make an xml file ( test.tap.nc.xml for example ) which contains a list of NC code blocks and their associated toolpath. 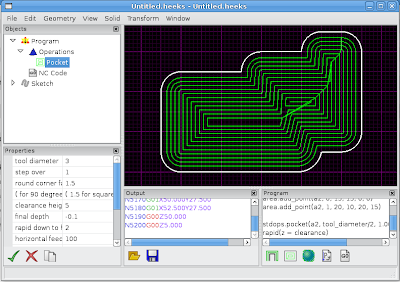 This is then imported into HeeksCNC so that it can display the NC code and the toolpath. I hope this makes things clearer. I've made arc input work for area clearance. 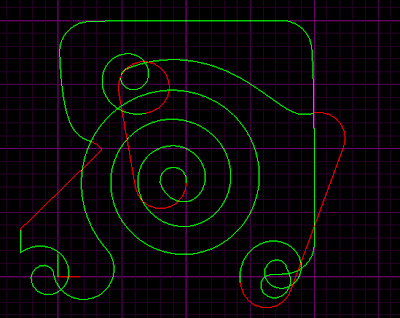 The output is still lots of little lines, where it looks like arcs, though. 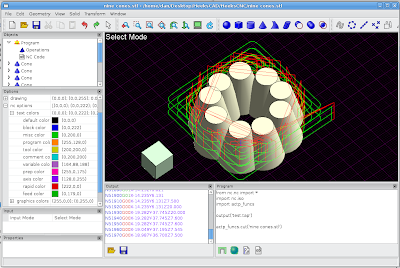 The toolpath is calculated in about 1 second. It builds for Linux too now, although with loads of warnings. Here it is working in HeeksCNC. The default values cause 90 degree or blunter corners to be offset with lines. I'll have to make this an option in my CArea::Offset function. It took me a while to see that the Offset function is actually called "Correction". There are comments that tell me that, but I wasn't reading the comments. I can now almost do area clearance machining. I have made a class CArea to make these functions work the way I expect, it is not finished yet. I have made a Python module. I have added my latest work to it. This example work OK now the start point is in the right place. 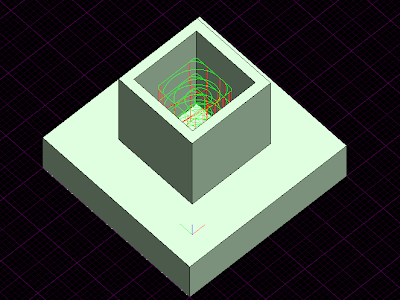 It works OK, if you define the solid in the right way. 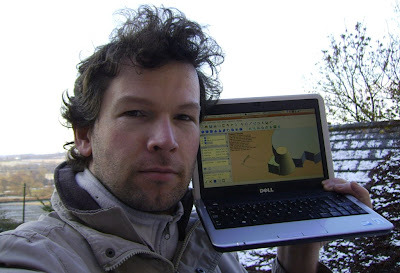 DanielFalck from #cam has found where to edit the start point, so we hope to do pocketing. This is this result ( click on picture ). It looks like the algorithm doesn't car if it goes outside the boundary, so long as everything inside the boundary is cleared. 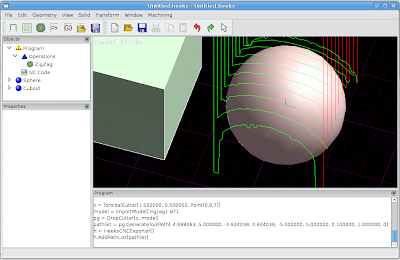 I made a Linux build for the adaptive roughing. Also I added some options in HeeksCNC for NC code colours. I made nine cones and tried adaptive roughing on them. It doesn't do the inside region.